PHOENIX – Election season is in high gear in Arizona, and amid messaging from candidates and political action committees, a new group joins the political conversation in the state this week: Roman Catholic nuns. 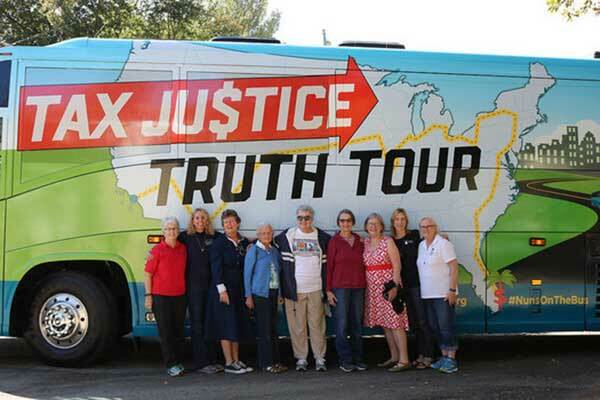 The “Nuns on the Bus tour” is driving cross-country to share a message of economic justice. A handful of Catholic sisters from orders around the country are to visit Phoenix and Tucson today and Thursday. The group’s leader, Sister Simone Campbell, said her faith teaches her to look out for society’s most vulnerable people – and in her view, politics is an important piece of that. The main focus of the Nuns on the Bus tour is the 2017 Republican tax bill, which the sisters see as favoring the wealthy at the expense of the poor. The group is calling for budget and tax policies that invest in communities and reduce economic inequality. The sisters will host town hall-style events in Phoenix and Tucson to hear from Arizonans about challenges they face. The nuns also have requested a visit with U.S. Rep. Martha McSally, R-Ariz., a U.S. Senate candidate. Campbell, who also is executive director of the NETWORK Lobby for Catholic Social Justice, said they want to know why McSally voted in favor of the tax bill. Tour dates and details are online at networklobby.org.